In my previous two blogposts (part I and part II) I’ve explained more about the Exchange Resource Forest model and how to implement Azure AD Connect into such an environment. In this blogpost I’ll show you more about creating a hybrid environment with an Exchange Resource Forest model. 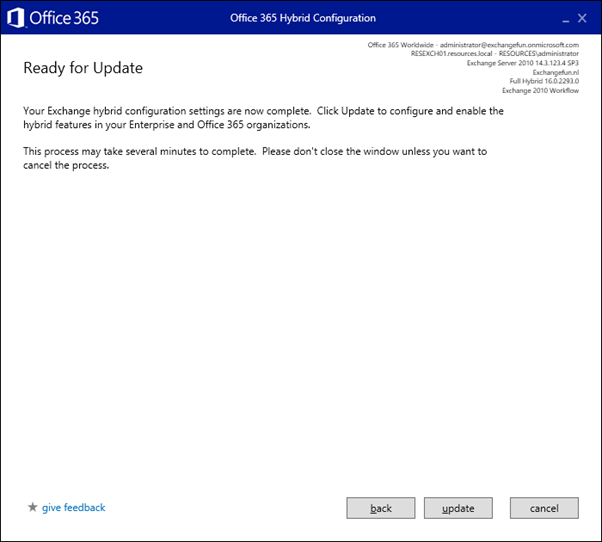 If you have been following my blog, or maybe my work as a consultant you most likely know I’m not a big fan of installing Exchange 2016 into an existing Exchange 2010 environment when creating a hybrid environment. 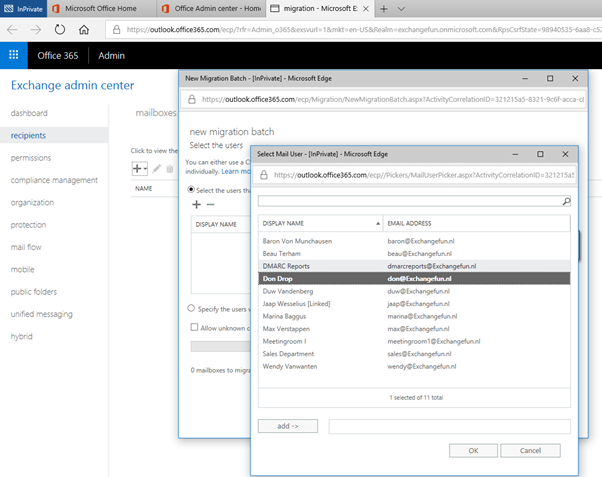 It adds a lot of additional complexity since you are halfway a migration to Exchange 2016, you need network and client access changes and most likely hit users multiple times. Better is to create an Exchange 2010 hybrid scenario and when the migration to Exchange Online is done, upgrade the Exchange 2010 remains to Exchange 2016. The only more challenging part is the use of an Edge Transport server for inbound and outbound SMTP, but if your SSL certificates are ok, you’re good to go. 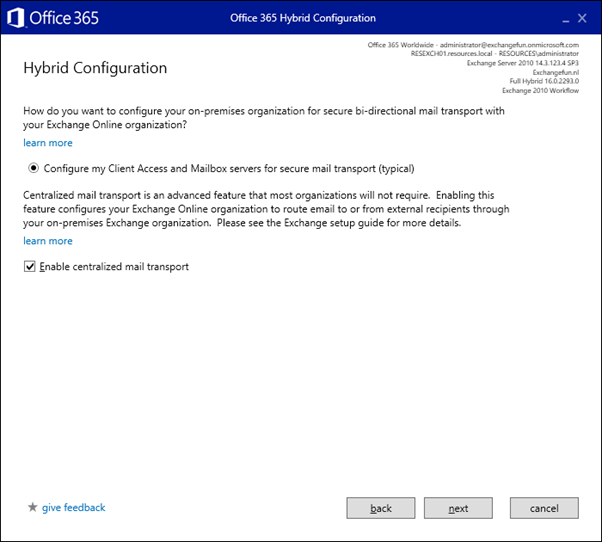 In our example, the Edge Transport server is used for inbound and outbound SMTP, but the hybrid SMTP will be sent directly from Exchange Online to the Exchange 2010 multi-role server. Centralized Mail Transport will be used, so all mail will always go via the Edge Transport server, even outbound mail from Exchange Online. Note. Before you continue, you have to make sure that your certificates are ok, that a valid 3rd party certificate is used and bound to IIS and SMTP, and that your load balancer is configured correctly. A common pitfall is that address translation occurs, and that all inbound connections originate from the IP address of the load balancer. 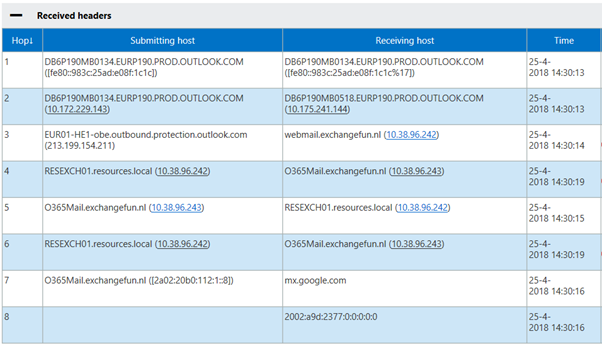 In this case inbound SMTP ends up on the wrong connector, causing secure traffic between Exchange 2010 and Exchange Online to fail. 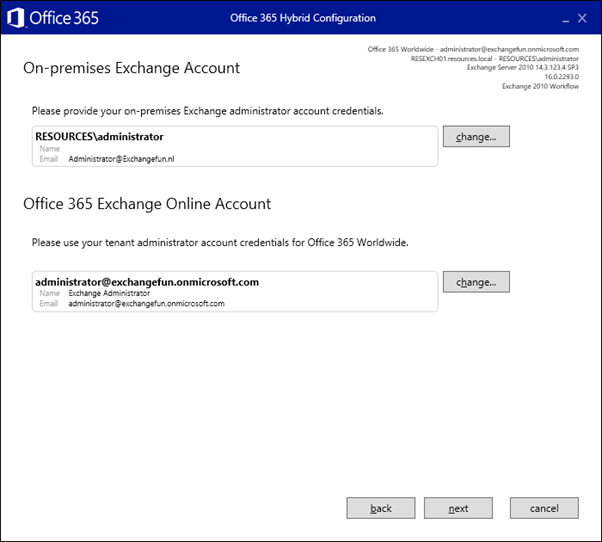 Logon to the Exchange 2010 server and download the Hybrid Configuration Wizard at https://aka.ms/TAPHCW and start the wizard by clicking the Install button. Continue with the wizard, select Full Hybrid (or minimal hybrid if you need to), and create a federation trust (and enter this crazy TXT record in public DNS). When you reach the radio button for Configure my Client Access and Mailbox server window, you can select the enable centralized mail transport checkbox if you want to. 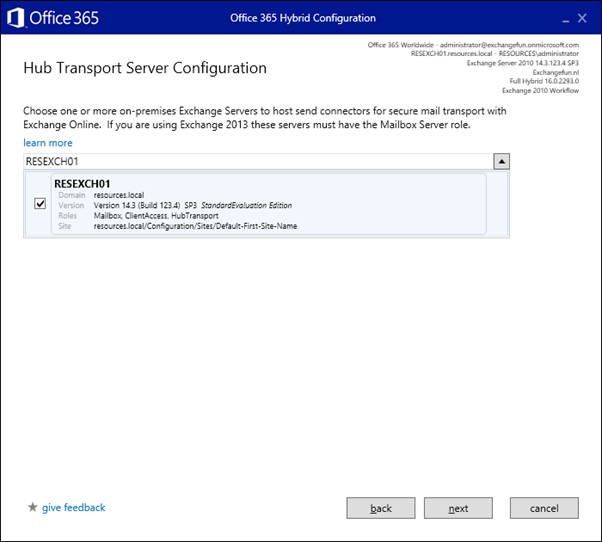 Select the Hub Transport server (or Mailbox server when running Exchange 2013 or Exchange 2016) that should be used for secure communication with Exchange Online. This server is configured in an Office 365 Send Connector and a Receive Connector from Office 365 is created on this server. Select a proper certificate (which should already be present on the Exchange server of course), enter the Organization FQDN that’s used to access your on-premises environment (i.e. webmail.exchangefun.nl) and you’re ready to finalize the hybrid configuration wizard. The options you’ve selected in the wizard are now pushed to the Exchange server and Active Directory when you click the update button. We’ve now configured a hybrid configuration with an on-premises Exchange 2010 server that’s in a Resource Forest. Click Next to continue, enter a migration batch name, increase the bad item and large item limit if needed and follow the wizard. 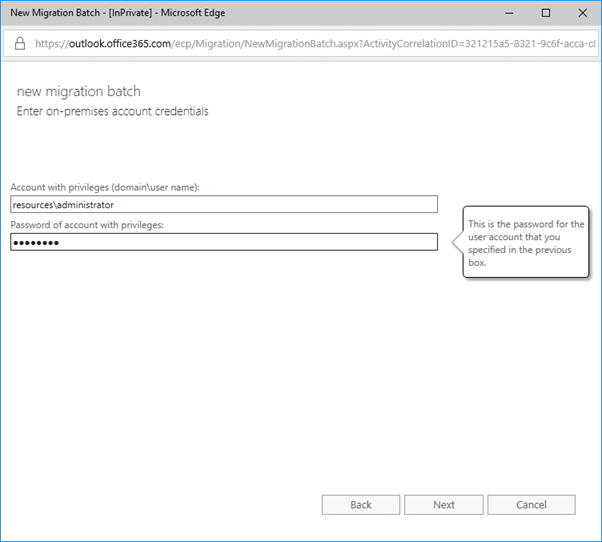 The migration batch is automatically started, but manually completed. 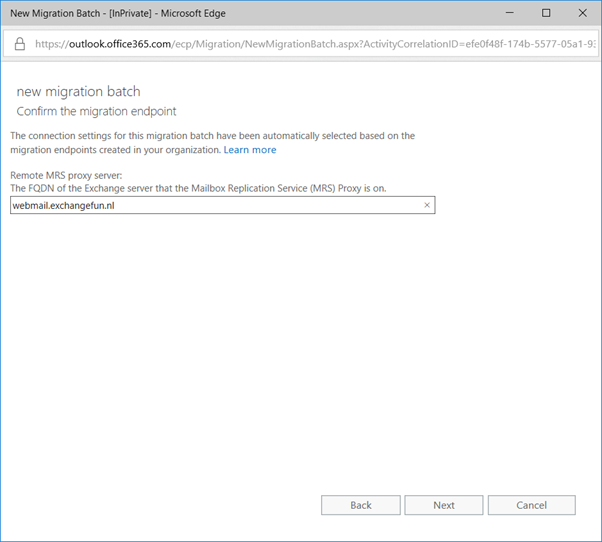 I typically complete migration batches off business hours, but for a test or lab environment you can safely select to complete the batch automatically. When you click the new button a new migration batch is created, and the mailbox move is automatically initiated. 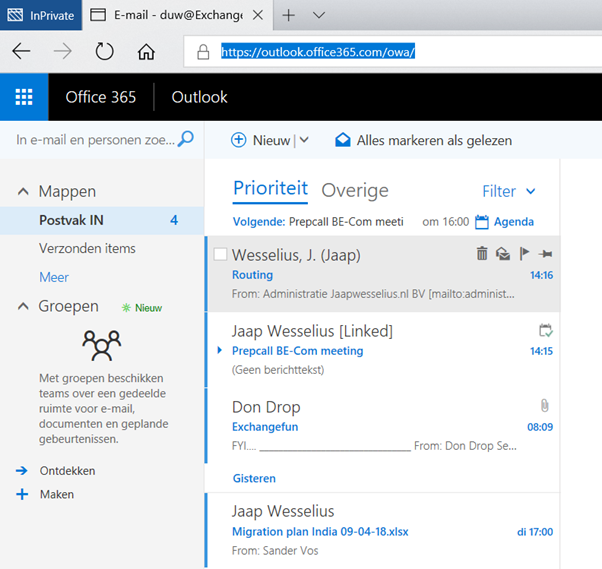 When the mailbox is moved to Exchange Online you can logon to Office 365 and start testing. The figure might be a bit blurry, but in the last column we can see that TLS 1.2 is used for communications between Exchange Online and Exchange 2010. Inbound messaging is working as well. 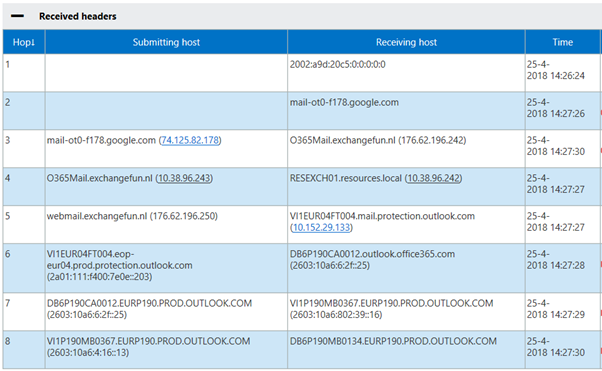 When mail is sent from Exchange Online to Gmail, we can see in the headers that mail goes from Exchange Online to the Exchange 2010 server, to the Edge Transport server and to Gmail. The Exchange 2010 server will contact Exchange Online using Exchange Web Services (EWS) to check the availability for the users Don and Duw. The server in Exchange Online now contacts the Exchange 2010 server (via the load balancer) using EWS to check the availability of the on-premises mailboxes. It happens a lot that availability information or free/busy information in the on-premises environment is not available. This can be an Autodiscover issue, a certificate issue or a pre-authentication issue in the load balancer. Enough stuff to troubleshoot in this case. So, it looks like everything is working as expected. 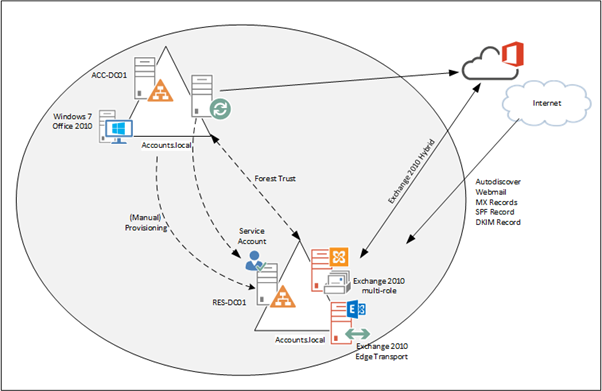 In this blog post and the previous two blog posts I’ve explained more about the Exchange Resource Forest model, how linked mailboxes are related to their corresponding accounts, how to implement Azure AD Connect in a Resource Forest environment and how to setup a hybrid environment in this model. 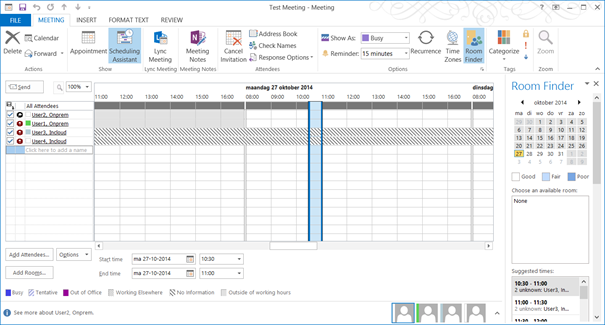 This was built on top of Exchange 2010 but is very similar for Exchange 2013 or Exchange 2016. If all prerequisites are met it doesn’t make any difference if you’re running a single forest environment with Exchange installed or a Resource Forest model. Since the Resource Forest is a fully supported scenario by Microsoft, the hybrid environment in a Resource Forest is fully supported as well. 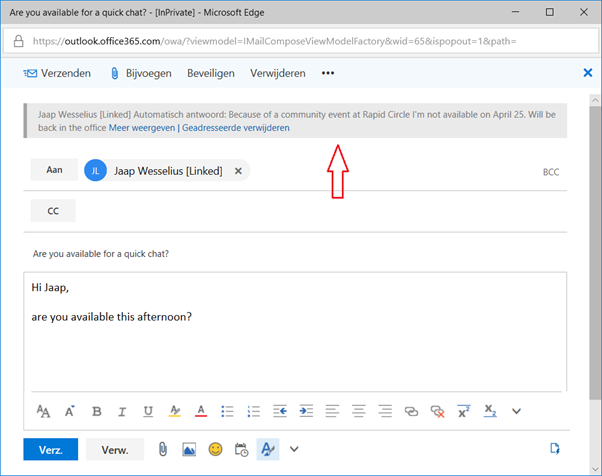 In the next blog and final (part IV) of this series I’ll dive deeper into the provisioning part of linked mailboxes and Office 365. 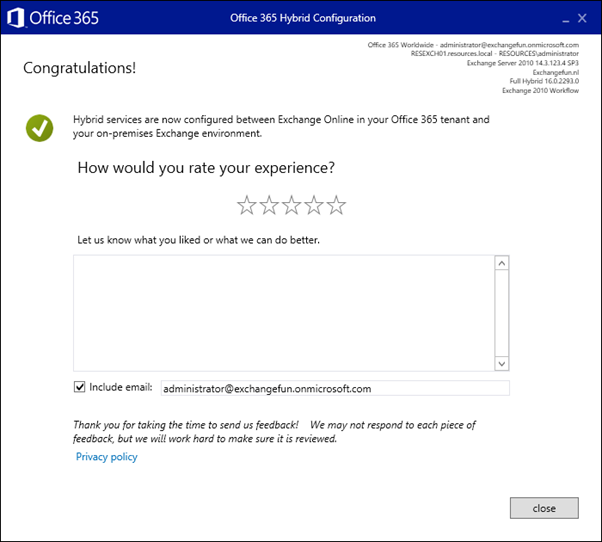 I am working with a customer that’s running Exchange 2010 on-premises and want to move to Office 365 in a hybrid scenario. The hybrid servers are running Exchange 2010. After implementing a hybrid scenario everything was working fine, but after some time I received calls that free/busy wasn’t working correctly anymore. 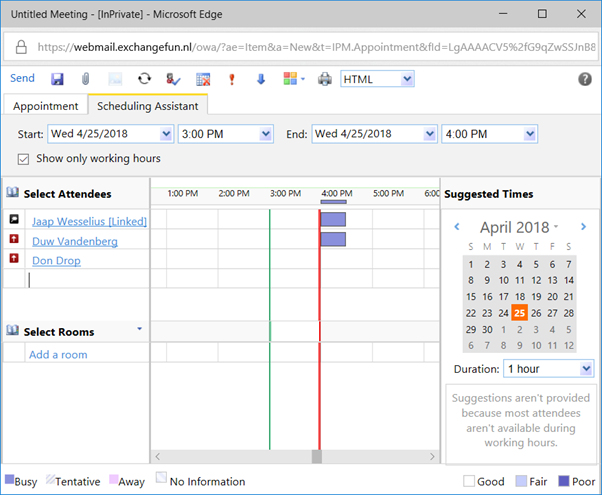 When a user with a Mailbox in Exchange online and he wants to schedule a meeting with a Mailbox in Exchange 2010 on-premsises all goes well and the user can see all free/busy information from all users.